Bronze, humbugs, wallpaper and electronics: what’s your favourite element? As a chemistry teacher I’m sometimes asked for my favourite element. Don’t tell anyone, but I don’t really have a single favourite. That would be a terribly boring answer though, so I usually pick something to make a relevant point. Carbon, for example, for being the stuff of life, for having a whole third of chemistry – organic chemistry – devoted to its compounds, and because diamonds are fascinating and really very pretty things. Or sometimes I go for xenon, for being a noble gas, for its potential use as an anaesthetic, and just because its name starts with an X (have a go at this: name five words that start with X without googling*). And then, if I think we’ve got time for a story, I might go for the famous and much-maligned element number 33: arsenic (As). After all, if it weren’t one of the world’s most famous poisons you’d have to love it just for having the word ‘arse’ in its name. So, a little background. It’s the 20th most common element in the Earth’s crust, and is actually one of the oldest known elements. It was officially first documented around 1250 by a Dominican friar called Alvertus Magnus but it’s been used for more than 3000 years, going back as far as the bronze age when it was added to bronze to make it harder. It’s a metalloid, which means it’s neither quite metal nor non-metal, and these days its most important use is in the electronics industry. There are many, many interesting stories associated with arsenic. One of my personal favourites, if that’s the right word, is the story of the Bradford Sweets Poisoning. Back in 1858 a Bradford confectioner known as ‘Humbug Billy’ was buying his mint humbugs from another local character called Joeseph Neal. At the time, sugar was expensive so Neal was in the habit of cutting it with something called ‘daft’, a mysterious substance that could contain anything from limestone to plaster of Paris. Neal sent his lodger to the local pharmacy to collect the daft. The druggist was ill, and somehow or other his assistant managed to sell Neal’s lodger 12 pounds of arsenic trioxide (you might imagine this was an expensive error, but arsenic was actually surprisingly cheap: half an ounce cost about the same as a cup of tea). The mistake went undetected, despite the sweetmaker who worked for Neal suffering symptoms of illness during the sweet-making process, and despite the resulting humbugs looking so different from normal that Humbug Billy managed to buy them from Neal at a discount. Humbug Billy himself promptly became ill after eating the sweets, but nevertheless still sold 5 pounds of them from his market stall that day. Subsequently about 20 people died and a further 200 became ill. To start with the deaths were blamed on cholera, common at the time, but soon they were traced to the sweet stall. Later analysis showed that each humbug contained enough arsenic to kill two people. This tragic tale led to The Pharmacy Act 1868 and the requirement for proper record keeping by pharmacists. Ultimately it also led to legislation preventing the adulteration of foodstuffs, such as for example, oh I don’t know, sneaking horse into something labelled beef. Historically arsenic was also used in dyes and pigments, perhaps most famously Scheele’s Green – also known as copper arsenite and invented by Carl Wilhelm Scheele in 1775 – produced a wonderful green colour that was used to dye wallpaper, fabrics, added to paints, children’s toys and even sweets. Many poisonings in Victorian times were linked to toxic home furnishings and clothing. In fact, this probably explains the superstition that green is an unlucky colour, especially for children’s furnishings and clothes. Arsenic poisoning being very unlucky indeed. Next time you’re near a baby store, have a look: even today (arsenic pigments now long defunct, thank goodness) you still don’t see that many green things. One of the most famous people to die from arsenic poisoning was probably Napoleon. Originally thought to have been deliberately poisoned, analysis of his hair samples in 2008 demonstrated that his exposure had been long-term rather than sudden, and was probably due to the lovely green wallpaper and paint decorating the room in which he’d been confined. Then there’s George III, the famously ‘mad King George’. His episodes of madness and physical symptoms were linked to the disease porphyria, and 2004 studies of samples of his hair also found very high levels of arsenic which may well have triggered his symptoms. Ironically, he may have been exposed to arsenic as part of his medical treatment. 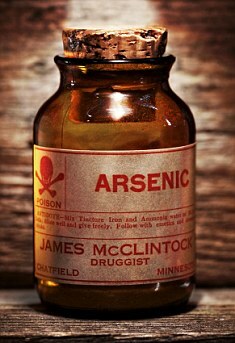 In fact historically arsenic was used to treat many medical complaints. It’s even been used as an aphrodisiac, thanks to the fact that small doses stimulate blood flow. In 1851 it was reported that peasants in Styria, a remote region in Austria, were in the habit of swallowing solid lumps of the stuff that, fortunately, passed through their digestive system relatively intact. However they absorbed just enough to given the women a rosy glow and the men an increased libido – resulting in something of a population boom. Upon hearing about this British manufacturers immediately began selling arsenic-containing beauty products, including soap and skin treatments, with predictably tragic results. Thanks to its toxicity arsenic is used in pesticides, herbicides and insecticides, although these uses are gradually being phased out. Despite being notoriously poisonous to most organisms, there are interestingly some species of bacteria whose metabolism relies on arsenic. Arsenic turns up naturally in groundwater and is absorbed by plants such as rice, as well turning up, in the form of arsenobetaine, in mushrooms and fish. Don’t worry though, this particular arsenic compound is virtually non-toxic. Today gallium arsenide, with the brilliant chemical formula GaAs, is one of biggest uses of arsenic. It’s a semiconductor, used in the manufacture of many electronic devices, including solar cells. Its electronic properties are, in some ways, superior to silicon so despite its inherent dangers its important stuff. So it definitely has one of the most fascinating histories of any of the elements, and I’ve only mentioned a tiny number of the many, many arsenic-related stories out there. From the bronze age to the computer age, arsenic has been with us, both friend and foe, and will be with us for a lot longer yet. So, what’s your favourite element? Tell me and maybe I’ll write about it in a future post! * betcha said xenon (of course), xylophone, xi and xu if you play Scrabble, x-ray and maybe xylem. Am I right? This entry was posted in Dangerous chemicals, Elements, Everyday chemistry and tagged arsenic, bradford sweets poisoning, bronze age, Carl Wilhelm Scheele, electronics, george III, metalloid, napoleon, pharmacy, poison, Scheele's Green, Styria, toxic, victorian times by katlday. Bookmark the permalink. Actually, I said xylophone, x-ray, xenophobe, xantus and xanax. (I didn’t know we could use xenon). 🙂 Why did you think xenon wouldn’t be allowed?